If you've been eagerly waiting for the chance to secure your reservation for Mitsunari, now's the time to place an order! He's available from AmiAmi, e-Capcom, HLJ, Kaiyodo and Yesasia, and within a few days that should expand to anywhere else which specialises in Japanese figures. If you're able to buy from Amazon Japan, that version comes with stickers as a bonus. My thanks go to Kaoru for keeping track of this news and spreading the word. 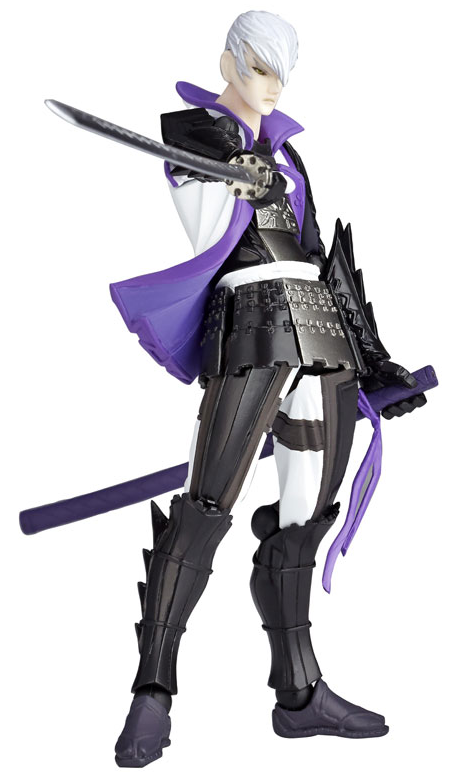 So long as you don't mind him being a little smaller, this is a great alternative for those who didn't want to pay the inflated prices that the full-sized Mitsunari Revoltech often commands. I hope they'll announce more Sengoku Basara characters for the Revolmini treatment soon. 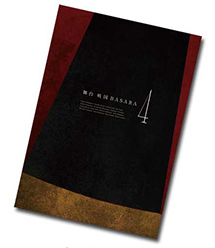 In just one week from today, Butai Sengoku Basara 4 will finally start its run in Japan, updating the stage play series to bring it up to date with the games. It hasn't completely sold out but tickets are scarce in Nagoya and Osaka, and the official staff blog has been teasing fans with a series of updates from the actors (which regrettably don't yet show them in costume). 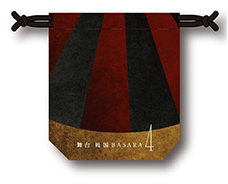 With this being Sengoku Basara, a new stage play also means more special merchandise. Here's what next week's attendees will be able to purchase at the venue - any leftovers will almost certainly end up in the Dais Shop when it reopens. Only the first three items have sample pictures so far. The items not pictured are described as follows. 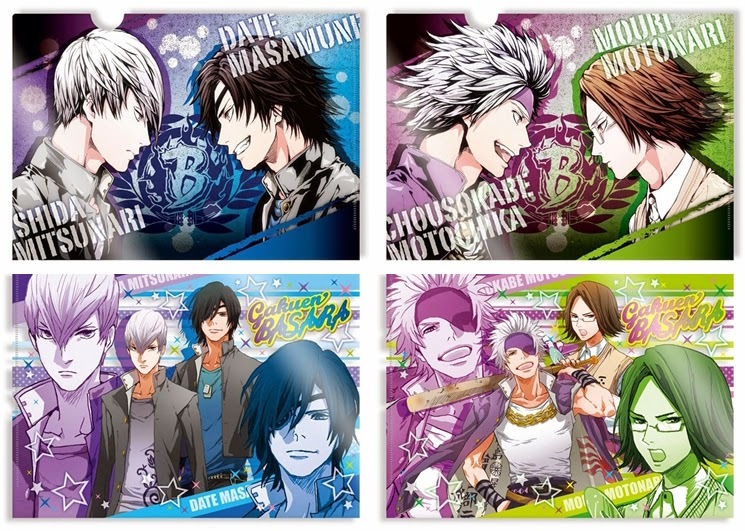 Four different A4 clear files for ¥600 each (Yoshiteru/Sakon/Katsuie, Masamune/Mitsunari, Ieyasu/Yukimura and Kojuurou/Sasuke). Fifteen different five-piece sets of large photographs for ¥1,000. Five different sets of A4 mutsugiri photographs for ¥1,000 (Yoshiteru/Kotarou, Masamune/Katsuie, Mitsunari/Sakon, Ieyasu/Yukimura and Kojuurou/Sasuke). I was confused about the abstract red/black/gold design until I realised it was clearly meant to look like a roulette wheel (I'm not that smart). The rich colours they've chosen are very nice; hopefully the stage play version of Ashikaga Yoshiteru will be as grand as the one from the game! Thank you to Tatzel for bringing these items to my attention! 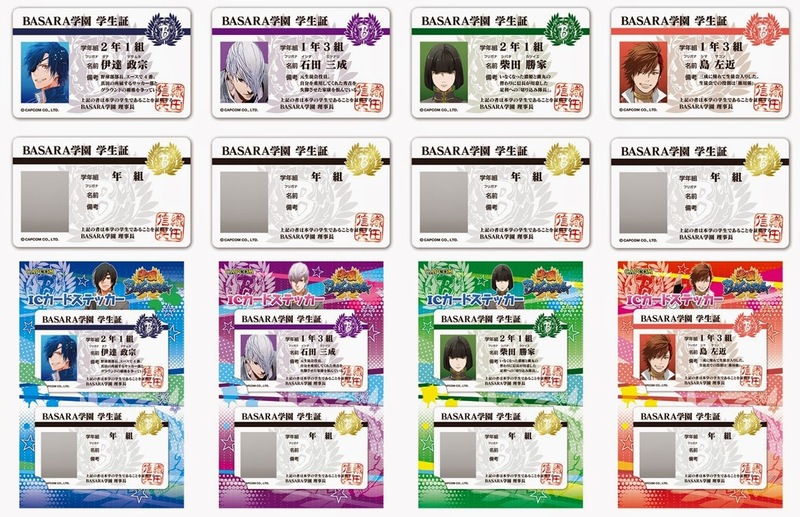 The Gakuen Basara parody spin-off continues to generate a crazy amount of decent merchandise, and once again it's all exclusive to Animate stores in Japan from mid-December 2014. If you can't buy from Animate through a proxy service, however, Otaku Republic is able to ship them worldwide. I really want those badges. The Mitsunari design is probably one of the most moe things the series has ever produced even if I'm not even a big Mitsunari fan. 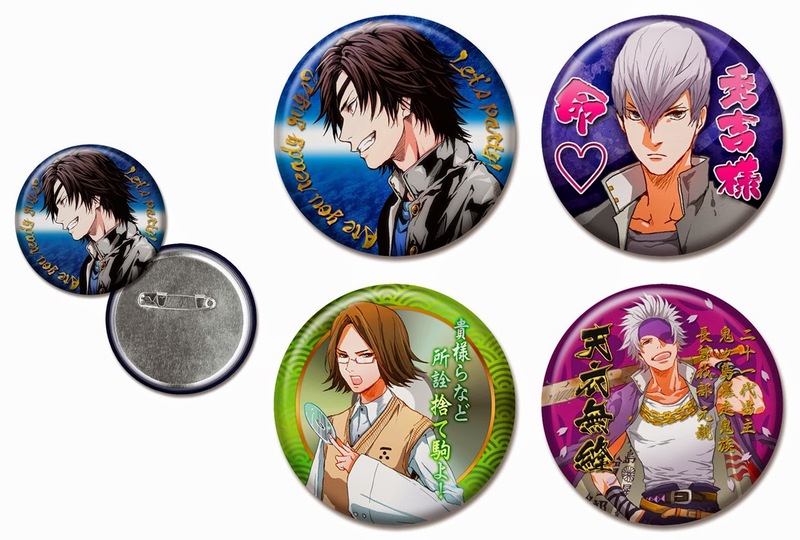 It seems unfair that some characters are getting so much more Gakuen Basara merchandise than others, though - in particular, I think it's about time the ladies of Gakuen Basara got some love! It's almost terrifying how many clear files there are for this series. 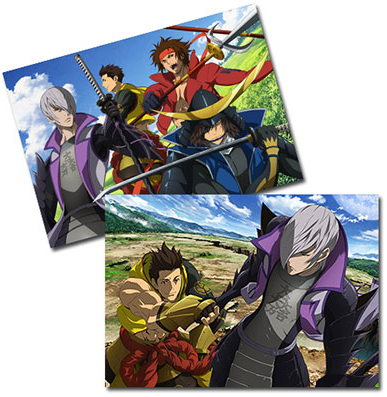 Devoted stationery collectors can add another two to their collections in December 2014 when the Sengoku Basara Judge End Clear File Set goes on sale for ¥756. Amazon Japan and AmiAmi have their listings up already. 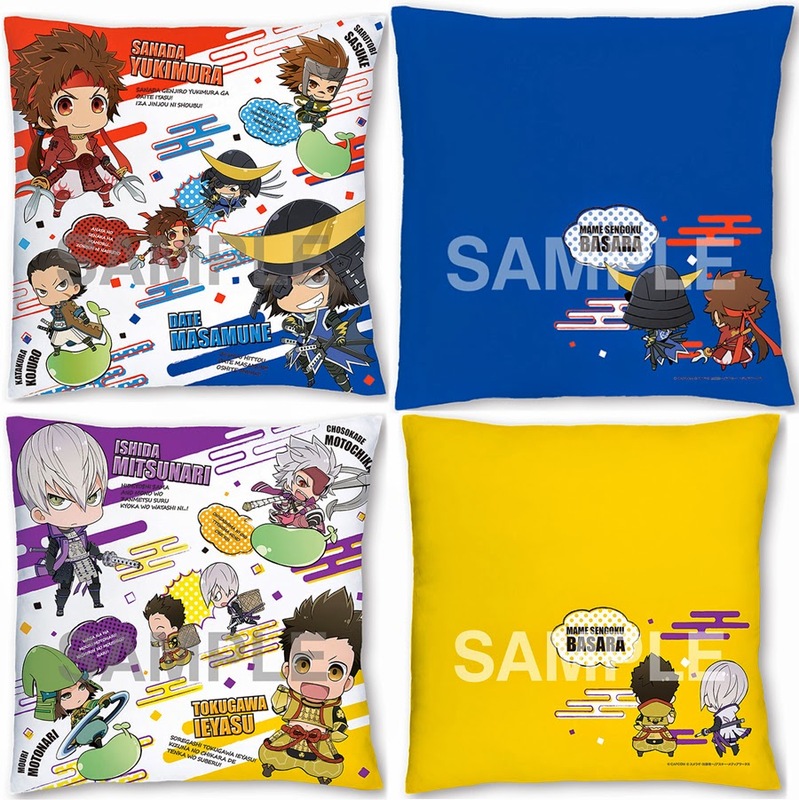 If you missed out on the two Mame Sengoku Basara 'Chara x Cushion' goodies from a few months ago, help is at hand - they seem to be receiving a general release this winter. Listings have appeared on AmiAmi (blue, yellow) and they're just as cute as ever. The cushions are scheduled for delivery in January 2015. 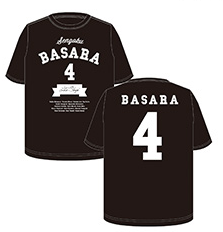 Each design costs ¥2,700. I know what you mean about the trouble storing all of the merchandise - I can't afford a bigger place to live but Sumeragi's art is so cute! We must be due for a new volume of Gakuen Basara soon, too...?